You’ve got only 10 days to get yourself over to Düsseldorf, Germany, for what’s left of drupa 2012. Yes, in one sense, that’s saying quite a lot because any other trade show that started on May 3 would have long since been over with by now. But drupa’s not just another show. It is THE place to be for the whole world of printing—and a healthy dose of paper and package converting, too. So, along those lines, here a quick look at just a few of the new product introductions to come out of the Westphalian Fairgrounds in the past few days. Enjoy! Following its pre-show publicity juggernaut, Landa Corp. unveiled its groundbreaking Nanographic Printing Presses, two of which are aimed specifically at the web-fed package-printing market. The Landa W5 is a 560-mm (22-in.) web width press capable of single-sided printing at up to 200 mpm (656 fpm) on plastic films and shrink sleeves (12 to 250 microns) and on label stocks, tube stocks aluminum foil and paper (50 to 300 microns). The 1,020-mm (40-in.) runs similar substrates at similar speeds. Both systems are 8-color-capable. As Landa NanoInk will be FDA-compliant for food packaging, the W10 should be of interest to mainstream packaging. At the heart of the nanographic printing are Landa NanoInk colorants, comprised of pigment particles only tens of nanometers in size. These nano-pigments are extremely powerful absorbers of light and enable unprecedented image qualities, the company says. The printing is characterized by ultra-sharp dots of extreme uniformity, high gloss fidelity and a broad color gamut. Nanographic printing begins with the ejection of billions of microscopic droplets of water-based NanoInk onto a heated blanket conveyor belt. Each droplet of aqueous NanoInk lands at a precise location on the belt, creating the color image. As the water evaporates, the ink becomes an ultra-thin dry polymeric film, less than half the thickness of offset images. The resulting image is then transferred to any kind of ordinary paper, coated or uncoated, or onto any plastic packaging film – without requiring pre-treatment. The NanoInk film image instantaneously bonds to the surface; forming an abrasion-resistant, laminated layer that doesn’t leave any residual ink on the blanket. Because NanoInk images are already dry, there is no need for post-print drying. Xeikon launched its new Xeikon 3030Plus, the fifth model in the Xeikon 3000 Series of digital label presses. With a top speed of 15 mpm (49.2 fpm), the new narrow-web printer offers entry-level technology with 50% more productivity versus competitive offerings in its class, the company says. At 330 mm wide, the Xeikon 3030Plus uses high-precision, LED-array imaging technology, which combines 1,200-dpi resolution at 4-bit per spot to deliver the finest print quality. Incorporating full rotary-printing technology, combined with virtually unlimited variable-repeat length, the press speed is not affected by either the label size or the number of colors used. 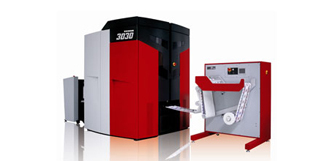 The Xeikon 3030Plus runs various labelstocks constructions including co-extruded films, BOPP, PVC and PET, paperboards, 40-350 gsm paper transparent and opaque PET films. Epson America announced its SurePress L-4033AW – a seven-color inkjet, digital label press with White ink that makes high-quality, short-run label printing easier and more efficient. The new system leverages EPSON SurePress AQ seven-color technology with new White ink, which can be printed first or last, for solid, opaque white printing on materials such as clear film and metallic substrates. To deliver precise color matching and accurate reproduction of spot and specialty colors, the ink set also includes Green and Orange inks for higher saturation and true-to-life shades. Press parameters include variable web widths from 3.15 to 13 in. up to 0.013 in. (0.32 mm) thick, and press speeds up to 16 fpm. 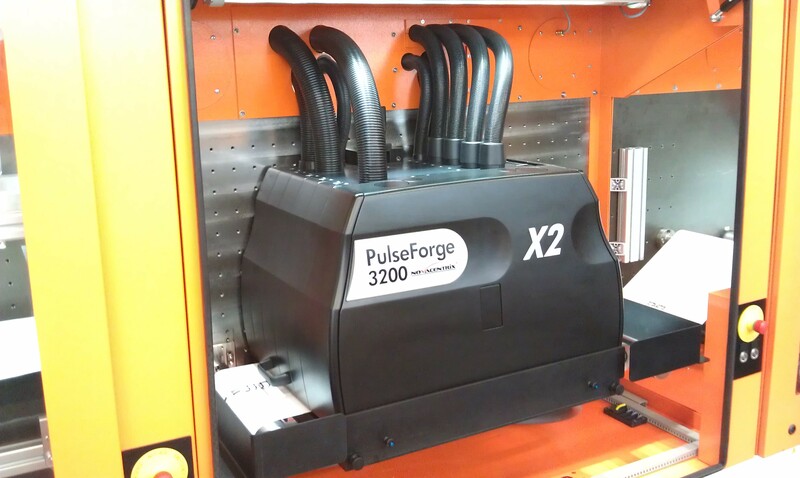 For those investigating printed electronics, NovaCentrix presented its new PulseForge 3200-X2, which offers increased production speeds and decreased consumables cost in comparison to other PulseForge tools. The system is being demo’d as integrated into a MicroFLEX™ roll-to-roll web processing system offered by 3D-Micromac AG. This duo is printing NovaCentrix Metalon® ICI copper-oxide reduction inks and curing them to copper in a single operation on-site in real-time. PulseForge photonic-curing tools process high-temperature materials on low-temperature substrates and are said to be ideal for drying, sintering, annealing and reacting the functional materials for the emerging printed-electronics industry, such as PV, RFID, displays, sensors and thin-film batteries. For a more sustainable laminating solution, Henkel has added a new solvent-free Liofol laminating adhesive based on renewable raw materials that makes it ideal for biofilms. The Liofol adhesive exhibits very good wetting behavior, which results in excellent laminate appearance. Moreover, it has a long workability time of up to 60 mins. Even after longer downtimes due to cleaning or resetting of the machine or a switch in film/foil materials, the adhesive will remain workable within the stated time. The long pot life helps to reduce material usage as it lets work to be done on the machine without needing to fear that the adhesive will have become unusable when production is resumed. Spain’s Comexi Group is showing its commitment to the flexible-packaging converting industry with several machines on display. Along with its partner BASF, Comexi is demo’ing a fully compostable package: BASF Ecovio® substrate with Premo®Film SXS certified inks from Flint printed on the Comexi Flexo F2 press and laminated on a Comexi NEXUS EVO with Epotal® ECO compostable, water-based adhesive also from BASF. For laminating, the new Comexi NEXUS Optima 450 is equipped with the Nexus OPTIMA drying module, closed-chamber doctor blade and self-cleaning system, which offers greater capacity for turbulence and great savings in energy consumption. For gravure printing, Comexi ACOM is showing a new unit that features the latest electronic innovations, such as Siemens Sinamics Simotion with built-in controls into the Comexi ACOM software. For finishing, the Comexi Proslit S-Turret slitter/rewinder opens up anew market as it’s aimed at slitting rigid and semi-rigid materials, such as paper and pressure-sensitive material along with flexible materials such as BOPP. This machine supports parent rolls from 1,400 to 2,200 mm wide and 1,500 mm in diameter. Finished rolls are rewound in a single turret shaft in diameters of up to 1,000 mm at speeds to 600 mpm. Represented by Matik here in the US, Goebel Schneid- und Wickelsysteme GmbH is running its fully automatic KPW3 slitter/rewinder; and Italy’s Omet is demo’ing a Varyflex flexographic web press for board and film and an X-Jet digital press. Taiwan’s KYMC introduced the new Moduflex mid- or wide-web, full servo modular in-line flexo press for multiple markets. The system provides fast register setup and tight register tolerances vertically or horizontally in-line with multiple printing and converting machinery. The Moduflex mid-web press has a 870-mm (34.25-in.) 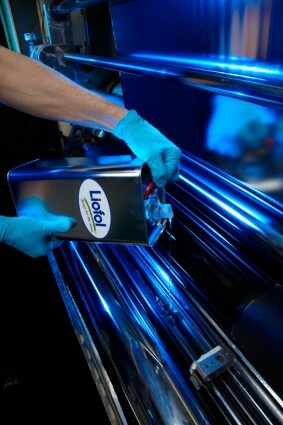 web with UV and/or hot-air drying for short-run folding carton either R2R or with a die-cutter and sheeter/stacker. 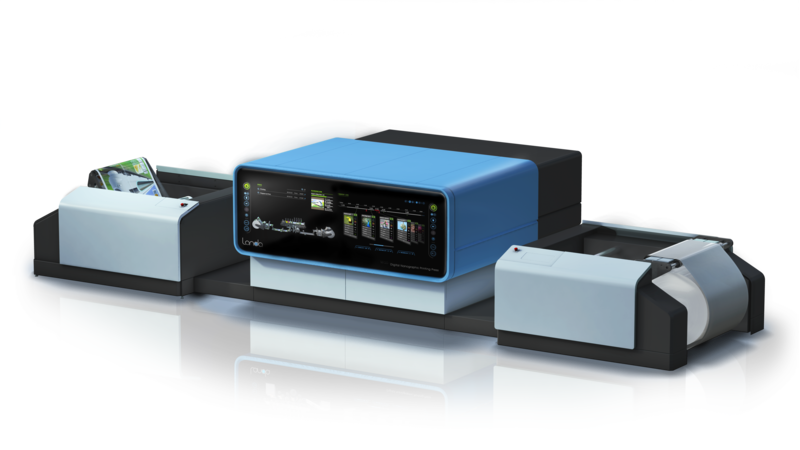 Shrink-sleeve or cut-and-stack label solutions with print repeat range of 300 mm (11.8 in.) to 800 mm (31.5 in.) allows for multiple SKUs. The Moduflex wide-web press comes in 1,070-mm (42-in.) to 2,000-mm (78.75-in.) widths with a print repeat range from 380 mm (15 in.) to 1,300 mm (51 in.). This entry was posted in coating/laminating, digital printing, flexible packaging, labels, package printing, paper/paperboard/cartons, printed electronics, slitting/rewinding, sustainability and tagged bioplastics, boxes, cartons, computer, converting, corrugated, flexible packaging, flexography, gravure, labels, packaging, paper, paperboard packaging, plastic film, printing, solar cells, sustainability. Bookmark the permalink.